The new study was accepted for publication in Geophysical Research Letters, a journal of the American Geophysical Union. Two years ago, Gensini led research on a method to predict the likelihood of U.S. tornado activity weeks in advance. Last year, of 26 long-range (two- to three-week) forecasts for increased, average or below average U.S. tornado activity, more than half were “spot on,” Gensini said. Most of the other predictions were only slightly off. The new study is an extension of the tornado research, suggesting a similar method can be used in sub-seasonal forecasts of hailstorms. “There’s a high degree of correlation between environments that produce hail and tornadoes, but not all storms produce both hazards,” Gensini said. 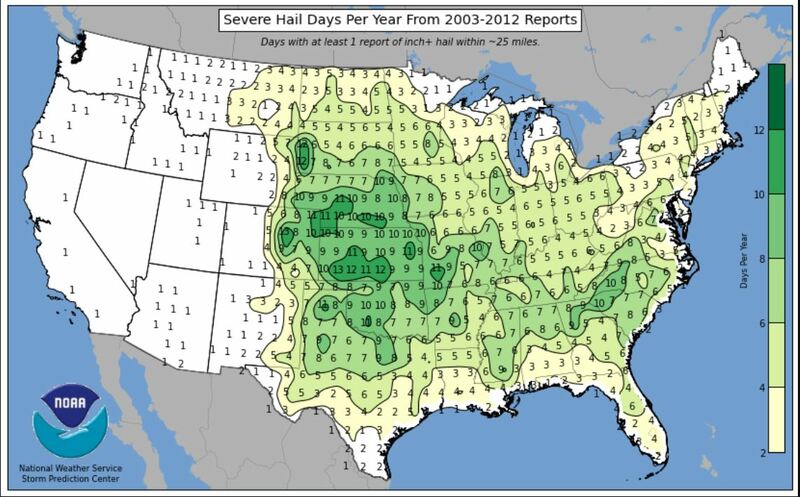 While the method would be used to forecast hail activity for the country in general, portions of Texas, Oklahoma, Arkansas, Kentucky, Missouri, Mississippi, Tennessee, Illinois and Indiana are most vulnerable to the phenomenon. Gensini and Allen examined hail observations from national storm data for the period of 1979 to 2016. They compared those events with changes in the Global Wind Oscillation (GWO) index, a collection of climate and weather information that measures atmospheric angular momentum, or the degree of waviness in the jet stream. The GWO index has eight distinct phases. Four of those phases were reliable predictors of increased inland hail activity during peak storm seasons, according to the study. Last year, Gensini accurately forecast ten tornadoes three weeks in advance, with a 66.7% overall success rate. It is important to mention that his success rate is related to the predicted production of tornadoes over an area of tens to hundreds of square miles. The GWO is a globally integrated quantity that represents atmospheric variability, which is often associated with the position of jet streams around the globe. At times, this variability can lead to episodes of extreme weather phenomena and rapidly changing weather patterns. The tracks are published so provide a kind of jet stream history. The jet stream orientation definitely influences the strength of storms. I’m a little skeptical that they can predict the location of hail storms three weeks in advance, though. A lot of factors are involved that don’t occur until the jet stream and the storm front are in position. They can probably predict the areas with an enhanced probability of hail, but I don’t think they can nail it down to a specific location, especially three weeks in advance. A few hours in advance maybe, but not three weeks. TA: see my earlier comment re ‘an area of tens to hundreds of square miles’ for tornadoes. But they expect or at least hope to make further advances in accuracy. I am afraid that the ski resorts in the Swiss Alps will be cut off from the world. Snow + low temps for Davos…even colder the week after. I wonder how it will be tomorrow? You can see how the jet stream over the Atlantic pulls strongly to the north. This is due to the low magnetic activity of the solar wind. The heaviest snow has not yet reached Davos. The heavy snowfall in Davos is just starting. Worth seeing.